Few authors are better known than Theodor Seuss Geisel, a.k.a. Dr. Seuss. Yet, to this day, his Secret Art and his fantastical Hat Collection are virtually unknown to the general public. 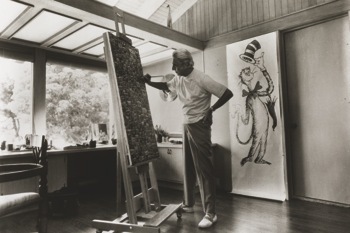 Throughout his lifetime, Ted Geisel created paintings and collected hats which he secreted away in a hidden closet at the Seuss Estate. In honor of the 75th anniversary of Dr. Seuss’s second book, The 500 Hats of Bartholomew Cubbins, a special Hats Off to Dr. Seuss! exhibition has been mounted that combines these two secret collections. Audrey S. Geisel, the widow of Dr. Seuss, has generously opened up the estate’s legendary “hat closet” to allow the public a peek at Dr. Seuss’s hat collection. These hats, along with the Secret Art, will arrive at Peabody Fine Art in Menlo Park today. The hats will be exhibited alongside his little-known Secret Art, a series of estate-authorized works adapted from Ted Geisel’s original drawings, paintings, and sculpture. This historic collection will be available for viewing and purchase. “Ted Geisel painted and sculpted throughout his lifetime,” explains Bill Dreyer, curator of the exhibit who will be at the opening evening event from 5:00 pm to 8:00 pm on Saturday, April 27. “He painted late at night, and this body of work remained a secret.” The exhibit will continue until May 12. In his artwork, as in his personal life, Dr. Seuss saw hats as transformational. From the time he was a small boy in Springfield, Massachusetts, he was aware of their inherent magic. Far beyond their functionality, hats were the accent— the exclamation point — on a person’s behavior. They could entertain, delight and embellish, even tease and taunt, but most of all, hats helped Dr. Seuss deliver a world of life-changing inspiration. That “next book” — Dr. Seuss’s second of 44 — became The 500 Hats of Bartholomew Cubbins.